It’s a rare and beautiful thing when a bar in Los Angeles lives long enough to see its 15th anniversary. And that’s why Jones Hollywood, barestaurant institution near the Warner Bros. lot, intends to go all out for its 15th tomorrow night. All day from open (12pm) to close, new and old friends of the bar will be treated to $5 Herradura, Finlandia, or Jack Daniels cocktails as well as $2 selected beer like Stella and Peroni, and 15 of Jones’ most popular menu items — spaghetti and meatballs, pepperoni pizza and grilled salmon — for only $5 each. Yup, this bar also happens to be a molto bene Italian restaurant, serving up pizzas, pasta and salads created by Chef John DeLucie of New York’s Waverly Inn. So if you’d like to reserve a table for a proper evening of dining and drinking, call (323) 850-1726. Each table will have disposable cameras for you to play with, just like they do at wedding receptions to commemorate the moment. A blast from Jones’ past will also be in attendance: original GM, Keith McCarthy, who will guest bartend from 9pm to close. He worked at Jones for six years before moving on to the likes of Falcon Hollywood and Anisette. And current bar manager, Eric “ET” Tecosky, has been manning Jones for the past 10 years, earning a respected place in L.A.’s cocktail community and even creating his own company cocktail lovers are well familiar with, Dirty Sue, as in the original Dirty Sue Dirty Martini Mix. Check out a classic dirty martini and Dirty Sue Bloody Mary at the party. Even though this is an all-day affair, things are sure to get packed. But not to worry, if you show up tomorrow and find it at capacity, Jones will give you a raincheck to visit at a future date when you can still enjoy those anniversary prices. So nice! Very nice! Even a raincheck option! I can’t wait for this event! I’ve got my reservations. 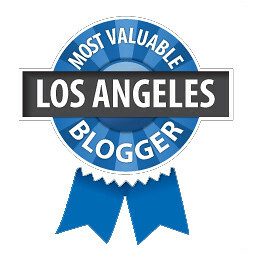 Hope to see fellow LA bloggers there.